Sana'a has been continuously inhabited for over 2,500 years. Its religious and cultural heritage is reflected in its 106 mosques, 12 hammams (bath houses) and 6,500 houses built before the 11th century.2 The city's architecture has been damaged, demolished and rebuilt through flooding, wars and prosperity. Yet, it wasn't until the modernization in the 1970s that the city's architectural fabric was truly in danger of disappearing. In the early 1980s, at the request of the Yemeni government, UNESCO launched an international campaign to conserve the city, which has been lauded world wide as a success. After considerable preservation and rehabilitation efforts, the city was designated as an UNESCO World Heritage Site in 1988 and given an Aga Khan Award for Architecture in 1995. While conservation efforts have been successful, little has been written to analyze the impact of the resulting tourism and development. Located in the southwestern tip of the Arabian Peninsula, Yemen's earliest excavated village settlements are dated to c. 5000 BC and the first urban settlements on the eastern deserts date from around 1200 BC. Sana'a lies in a fertile basin over two thousand meters above sea level, on a major communication axis that crosses the mountains of Yemen. As part of the African Horn where the Red Sea meets the Indian Ocean, it is often described as the ancestral heartland of the Arabs (Fig. 1). Sana'a is one of the most ancient surviving cities in Arabia and arguably the longest continually inhabited city in the world. By the first century BC Sana'a emerged as a center of the inland trade route. After the withdrawal of the Turks in 1630, Sana'a became the seat of an independent Imam. This ushered in a period of prosperity for the city, which lasted for nearly two centuries and can still be seen in the quality and quantity of buildings from that time. Most of the domestic architecture still standing in the city dates from this period and later, while the extant mosques reach back well over one thousand years and fragments of towers are as old as four centuries before the rise of Islam. Sana'a's architectural vocabulary was already well formed by the tenth century when Ibn Rustah wrote that most of the houses "are adorned with gypsum, baked bricks, and symmetrical stones. "3 The architectural heritage of Sana'a consists of multi-story buildings decorated with geometric shapes and horizontal bands rendered in gypsum, narrow streets, urban gardens, elegant minarets and imposing monuments (Fig. 2). The streets of the city are flanked by towering houses five to nine stories high. The houses are constructed of ashlar stonework from six to ten meters above street level where exposed brickwork then takes over.4 In Sana'a the space between buildings is just wide enough for pedestrians and mule-drawn carts. Timber is in short supply since trees are relatively rare and small and so the traditional architecture of Sana'a relies on stone and clay bricks decorated with gypsum plaster. Symmetrical balance is clearly a desirable characteristic in the houses of Sana'a and facades have strong ingredients of conventional formality. 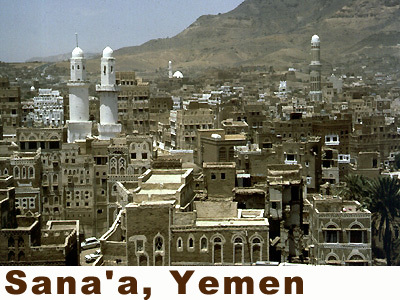 Sana'a has been an important center in southwestern Arabia for nearly 2000 years. 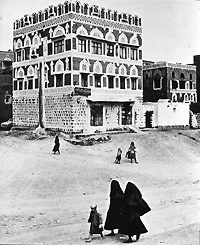 Until the end of the Yemeni civil war in 1969 the city was closed to outsiders for two centuries, its unique multi-story buildings protected behind mud walls. A traditional way of life was preserved in a society that values looking after poor people and old animals. The city, though in need of maintenance, was clean and sanitary. The opening of the country to the outside world in the 1970s, and the growth which accompanied the decision to make Sana'a the capital of the new Yemen Arab Republic, posed new challenges to the old city. The huge influx of dollars from the oil boom in neighboring Saudi Arabia, combined with a rapidly growing population, placed considerable stress on the old city's historic buildings and its inadequate infrastructure. Sana'a grew extraordinarily fast as oil workers returning home invested their money in property. The population grew from about 55,000 in 1970 to 250,000 in 1982.5 City growth by 1978 was out of control and with the new money came more automobiles. Urban Yemenis abandoned their houses because they could not afford to maintain them, and preferred new villas out of town. The main shopping, banking and government services shifted out of the old city, mainly to the west and northwest. Educational, recreational, entertainment and health facilities also moved away to an area outside the walls. Wealthier residents moved away due to the unsanitary condition of the streets, lack of services and the relative inaccessibility of their houses by vehicles. They relocated to areas that promised a modern lifestyle adjacent to new facilities. Lower income Yemenis moved in to the old city and conditions deteriorated. UNESCO's conservation program stresses that expertise, fellowships, equipment and voluntary financial contributions are urgently needed from all sources if the campaign is to be successful. One, preserve as much of the physical context and as many of the monuments as possible, in order to maintain the city's unique character together with its sense of age and history. Two, ensure the preservation and rehabilitation of the traditional way of life of the medieval city as much as possible for those who desire it, without stifling urban life or the population's desire for change and improved facilities. Three, create a simple method of implementation for every aspect of the preservation and conservation of the old city. The plan also provides typical examples of the architectural conservation necessary, strategies for reviving cultural traditions, a suggestion for a plan of action and preliminary financial estimates for the preservation and conservation of the old city. Key concerns addressed in the plan include water problems, impossible streets, traffic, unsightly wiring and aerials, poor maintenance, inadequate public amenities, and ugly (and harmful) modernization projects (Fig. 4). The Yemeni government has allocated $11 million to install and improve water and sewage systems and agreed to pave the city's streets and alley's with bands of black basalt and white limestone.10 Work on the mud walls of the cities started in 1987 and continues today, as does the rest of the program. A pool of skilled local labor has been set up for this purpose. Adaptive use projects have led to new functions for historic buildings, including a women's technical school, an art gallery, a craft center, and guest houses. Throughout the city, local owners were encouraged to renovate their houses under the guidance of GOPHCY. Work continued as Swiss, Italians and others renovated buildings for use as hotels, cultural centers and private residences. Both the public and private restorations have shown considerable sensitivity to the architectural features of Sana'a, incorporating traditional materials and construction techniques in the restoration process. New markets are now more accessible to vehicular traffic, thus boosting business and revitalizing the area's once sagging economy. Cultural life in the city has also improved with the addition of galleries and craft centers, which have encouraged the arts and provided employment for craftsmen. GOPHCY was successful in coordinating the efforts of governmental, bilateral and multilateral projects. It has helped improve the quality of life in old Sana'a thus earning the good will of the inhabitants, who have mobilized to continue the rehabilitation process. The bulk of the financing came from Yemen, but foreign aid from international organizations such as UNESCO and UNDP, as well as individual European countries and entrepreneurs, were vital to the project. UNESCO estimated that the conservation and infrastructure improvements outlined in their 1986 campaign would cost approximately $1,537,000 (at today's exchange rates). It was anticipated that the expenditures could be well below this number, since exact estimation was not possible upon the project's initiation. Yemen was successful in leveraging funds from European nations but the full cost of conservation has not yet been totaled. Certainly it was much more than original estimates since the paving component of the plan alone took over $3,000,000 to complete (L). Despite the successful conservation efforts in the old walled city, many problems remain unresolved, mainly traffic congestion, pollution and the removal and effective disposal of garbage. Preservation controls have been put in place but are not properly enforced. Perhaps the most bittersweet aspect of successful implementation of the plan is the growth of heritage tourism. The mixed blessing of tourism is that while it introduces new forms of revenue, it displaces residents and substitutes a locally sustainable economy with one reliant on foreign currency. There are considerable worries about the detrimental effects of tourism on historic sites from Uzbekistan to the United Kingdom. Its influence on Sana'a has yet to be properly analyzed. Such a study should be conducted soon to avoid returning to the dilapidated state of the city which preservationists faced in the late 1970s (Fig. 5). In the meantime, it is appropriate to recognize the victories of those who have been active in conserving the old walled city of Sana'a. The quality of life has improved, people have moved back, and the streets are now clean. In many ways the preservationists involved have solved what Michael Welbank calls the most intractable conservation problem today, the conservation of a cohesive high-quality urban area. In writing about the challenges of combining conservation and development in Third World countries he suggest that cities take a middle course where both interests come together in a "give and take" policy.13 It seems that Sana'a has accomplished this balance, ensuring that the city remains populated and, perhaps most importantly, enlisting the support and the interest of its citizens in the preservation of the past for future generations. 1. Ronald B. Lewcock, The Campaign to Preserve the Old City of Sana'a, Report Number 3 (Paris: UNESCO, 1986), p. 15. 2. "Organization of World Heritage Cities (OWHC), The World Heritage Cities: Sana'a." Web Page. http://www.ovpm.org/ovpm/english/cities/ns_sanaa.html. 3. Lewcock, The Campaign to Preserve the Old City of Sana'a. 4. Lewcock, The Campaign to Preserve the Old City of Sana'a. 5. 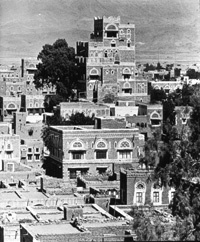 Lewcock, The Campaign to Preserve the Old City of Sana'a. 6. Ronald B. Lewcock, Class Lecture for MIT Course 4.239, 19 November 1998. 7. Lewcock, Lecture, 19 Nov. 1998. 8. Lewcock, The Campaign to Preserve the Old City of Sana'a, p. 103. 9. Lewcock, The Campaign to Preserve the Old City of Sana'a, p. 110. 10. Lewcock, Lecture, 19 Nov. 1998. 11. Cynthia C. Davidson and Ismail Serageldin, eds., "Conservation of Old Sana'a, Yemen" Architecture Beyond Architecture: Creativity and Social Transformations in Islamic Cultures: The 1995 Aga Khan Award for Architecture (London: Academy Editions, 1995). 12. Lewcock, Lecture, 19 Nov. 1998. 13. Michael Welbank, "Conservation and Development," Development and Urban Metamorphosis (Singapore: Concept Media Pte Ltd for the Aga Khan Award for Architecture, 1984). "Aga Khan Awards." Architectural Review. v. 198, no. 1185 (Nov. 1995): pp. 62-86. "Conserving the Traditional Architectural Culture of Yemen." Architectural Record. v. 171, no. 11 (1983 September): pp. 45-47. Davidson, Cynthia C., and Serageldin, Ismail, eds. "Conservation of Old Sana'a, Yemen." Architecture Beyond Architecture: Creativity and Social Transformations in Islamic Cultures: The 1995 Aga Khan Award for Architecture. London: Academy Editions, 1995. Kirkman, James S., ed. "City of Sana'a." Nomad and City Exhibition: Museum of Mankind, Department of Ethnography of the British Museum, World of Islam Festival 1976. London: World of Islam Publishing Co., 1976. Lewcock, Ronald B. Class Lecture for MIT Course 4.239. 19 November, 1998. Lewcock, Ronald B. The Old Walled City of Sana'a. Paris: UNESCO, 1986. Sergeant, R. B. and Lewcock, Ronald, eds. Sana: An Arabian Islamic City. London: World of Islam Festival Trust, 1983. Welbank, Michael. "Conservation and Development." Development and Urban Metamorphosis. Singapore: Concept Media Pte Ltd for the Aga Khan Award for Architecture, 1984. All images courtesy of Aka Khan Program, MIT Rotch Visual Collection. 1. The historic city boast a spectacular display of densely packed traditional structures. 2. Bright whitewash exhibits traditional patterns on the soft brown walls of residences. 3. 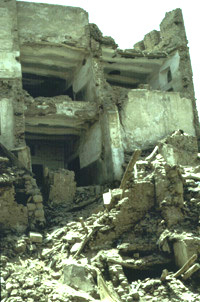 Picture showing the collapse of an old structure due to moisture in the walls. 4. Modern housing is directly adjacent to the old city. 5. Sana'a, arguably the world's longest continually inhabited city, is unquestionably worthy of further study. Back to the Course Main Page.